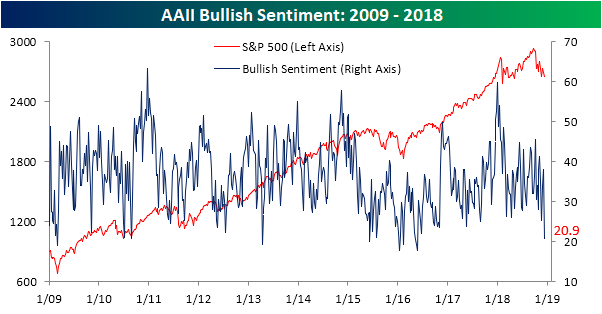 As we made note of last week, the survey of individual investor sentiment from AAII results for saw a surprising divergence from market’s price action due to timing issues of the survey. Last week saw a jump in bullish sentiment despite major declines on Tuesday. This week’s survey was much weaker, with bullish sentiment plunging. It’s now down to 20.9% from 37.9%. As shown in the chart below, this reading of 20.9% collapsed well below lows of the year and is at the lowest point since May 26, 2016. This was also the third largest WoW drop of the current cycle and the largest since mid-November of 2010 when bullish sentiment fell by only half a percentage point more. Obviously, if bullish sentiment collapses as it did this week, bearish sentiment sees the inverse effect. 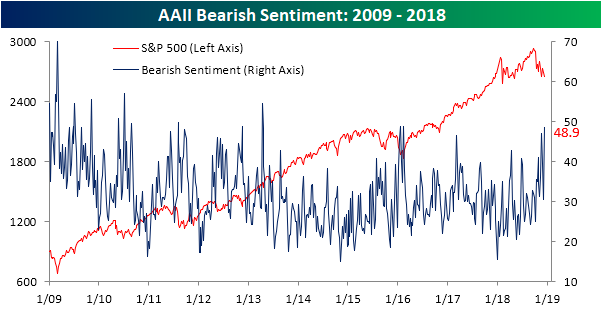 Bearish sentiment rose to the highest level in over 5 years to 48.9%; up 18.7% from last week. That is the largest uptick and the highest reading since April 11, 2013! Bearish sentiment is also into a region from early 2016 that saw a major global equity market bottom. 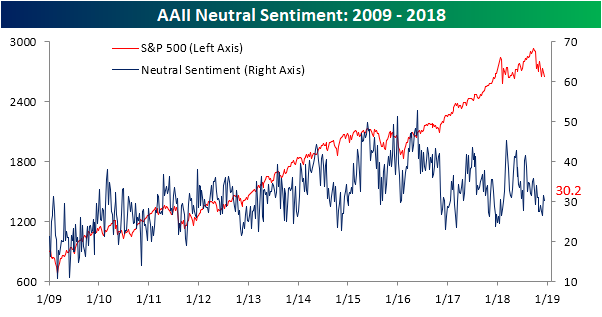 Neutral sentiment actually saw a slight decline this week meaning neutral and bullish investors likely all went into bearish sentiment.